In 2013, the idea for adjustable pouch underwear for men was born. Just like women need to wear a bra to support their womanhood, men need underwear that supports their manhood. Until now, mens underwear has not changed in centuries. 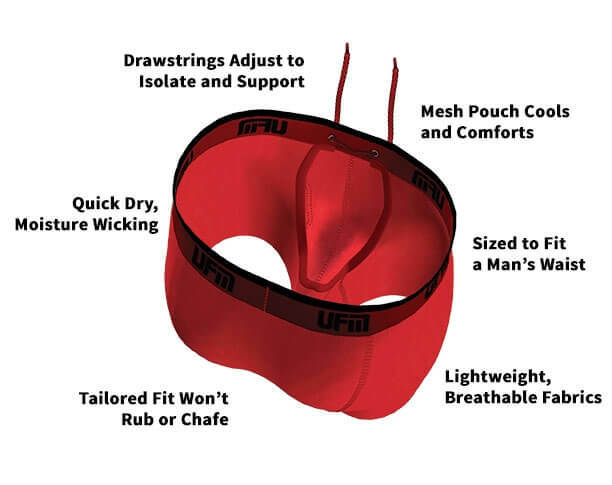 UFM has revolutionized briefs and boxer briefs. One day, one man decided he would create an underwear that truly offers support for your manhood in a soft adjustable pouch. No matter what size, the drawstring adjusts to fit your size and desired level of comfort. He called it Underwear For Men. Since 2013, Underwear For Men has received over 2,000, 5 star product reviews about how UFM Underwear has changed their lives. Every single UFM customer has a unique story. Some need to wear UFM’s technology for medical reasons. They haven’t been able to move or stand up due to swollen testicles and groin injuries. They haven’t been able to leave the house since surviving prostate cancer and becoming incontinent. They were afraid they’d have an accident. Not anymore! Some wear UFM because they play a lot of sports. Some wear UFM because they work long hours on their feet in the sun. Some wear UFM all day, every day. Underwear For Men is available in briefs, boxer briefs 6” and boxer briefs 9”. Underwear For Men have a US patented and Intl patents pending adjustable pouch that provides all day support and comfort for your manhood. Our design has modernized mens underwear by offering style, comfort, and more support than a jockstrap, tighty whities, mens boxer briefs or compression shorts. The adjustable pouch underwear is made from lightweight, smooth, breathable fabrics, with a mesh fly panel. The four-way stretch fabric offers greater mobility and prevents men’s underwear from bunching up, losing shape and wearing out. The US patented and Intl patents pending design reduces adjusting, chafing, rubbing, sweating and sagging by isolating your package in a soft, breathable pouch. Time to throw away your tighty whities and purchase a pair of our mens underwear or boxer briefs. Support Your Manhood! How to Choose Your Underwear Size: IMPORTANT- Underwear For Men is sized to fit your waist.